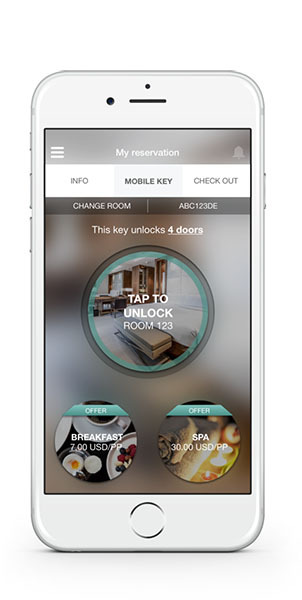 Zaplox Premium provides everything your hotel needs to deliver the ultimate mobile guest journey with mobile check-in/checkout and mobile key—in one seamless, custom branded app with deep integrations with leading PMS and lock systems. With Zaplox Premium app hotels can offer guests the conveniences of mobile check-in and checkout with the ability to review and pay for the hotel bill directly in the app. As a result, guests can skip the lines upon arrival and have more time to relax or work. Not only are guests able to check-in via the mobile app, but a digital key can also be securely distributed via the app, thus eliminating the need for plastic room cards. The room door is unlocked by activating the digital key in the phone and holding it up against the door’s Bluetooth Low Energy (BLE) lock. Since Zaplox Premium makes check-in and room keys readily available from the guest’s smartphone, the hotel needs less personnel at the front desk and staff members can be relocated to other tasks. Zaplox Premium enables the hotels to connect with guests before, during, and after their stay. For instance, the app provides a channel to communicate everything from practical arrival information to personalized offerings, including room upgrades, spa treatments, and dinner reservations. As a result, the promotions will generate incremental sales and improve guest satisfaction. In addition, customers can use the mobile app to book their next stay, resulting in more bookings and better margin compared to bookings from travel websites. The Zaplox Premium app is fully customizable with the hotel’s logo, images, and branding. Once the app is downloaded on the guest’s phone, it features the hotel’s own app icon. Reach out to Zaplox to learn more about how your hotel can benefit from the mobile guest journey with mobile check-in and mobile key.